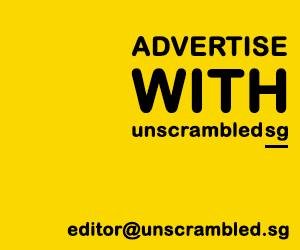 TL;DR – SMRT, what do you have to say for yourself now? Earlier this year, two SMRT staff were killed in a work-related accident. As if the loss of two lives wasn’t tragic enough, SMRT made the decision to sack two staff in September, including the driver of the train that hit and killed the two staff. This astounding decision was made after it supposedly concluded its internal investigations, before the Coroner’s Inquiry is conducted or the police investigations were completed. It’s clear that they were not pleading for leniency for the workers, but was pushing for fairness and to ensure due process. So who’s been charged this morning? As things stand now, official investigations have led to three parties being charged with wrongdoing this morning. One of these three parties charged included the assistant engineer, one of the two staff sacked in September. The other sacked staff, believed to the train captain, has not been charged, although investigations are still on-going. If found guilty, SMRT faces a fine of up to S$500,000. 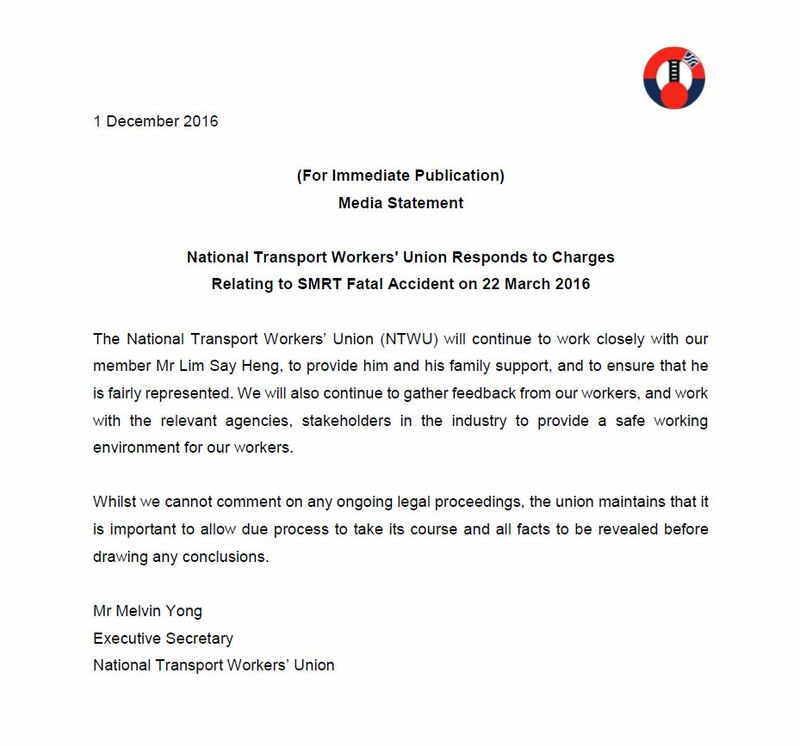 We hope SMRT Trains being charged is warning enough for the train operator and in fact, all other companies to dedicate more attention and resources to workplace safety and health so that deaths and injuries can be minimised. One life lost is one too many. SMRT’s director of control operations, Mr Teo Wee Kiat, 40, was charged under Section 48(1) of the WSHA. This section states that should an offence be committed by a company, an officer of this company (usually one of the directors) shall be guilty of the offence and be liable to be punished. Anyone found guilty under this Act shall be liable to a fine not more than S$200,000 or jail of up to two years, or both. The assistant engineer who was sacked by SMRT, Mr Lim Say Heng, 47, has been charged by the police. His charge sheet stated that he was the person in charge of the work party accessing the train tracks that day. He apparently did not ensure that the necessary safety measures were in place to make sure trains do not enter the train track while they were there. Lim has been charged for causing death by a negligent act under the Penal Code and may be jailed up to two years, a fine or both, if found guilty. From what the charge sheets are saying, it seems that investigations by the police and MOM found that the accident was a result of a larger, systemic error by SMRT. That’s why SMRT, as an employer, was charged. That’s quite different from SMRT’s own internal “investigations”, which seem to have pinned all wrongdoing on just the two staff they sacked. Or at least that’s how it seems to us from the outside looking in. All three parties charged will be back in court on 30 December for a pre-trial conference. What about the train driver? He’s not facing any charges for now, although as mentioned above, investigations are still ongoing to determine if any other individuals may be liable for workplace safety lapses in connection with the incident. So what now? What does this tell us of how SMRT had treated its staff by sacking them just through their so-called internal investigations. They did not even suspend duties, they sacked the staff who had been working for them for over a decade. This raises the question of how SMRT had conducted their own investigations. How did they come to the conclusion that only those two staff they sacked need to be punished? Why did they not think that their own management and director of operations need to be punished too? Will SMRT admit that they were wrong in sacking the train driver if he’s not found liable by the police and not charged eventually? Will they then reinstate him? Will they compensate him for loss of income during the period when he was probably wrongfully terminated? It is important to allow due process to take its course and all facts to be revealed before drawing any conclusions. “We will continue to work closely with our member, to provide him and his family support, and to ensure he is fairly represented”. So now, let’s now see what SMRT has to say for itself.